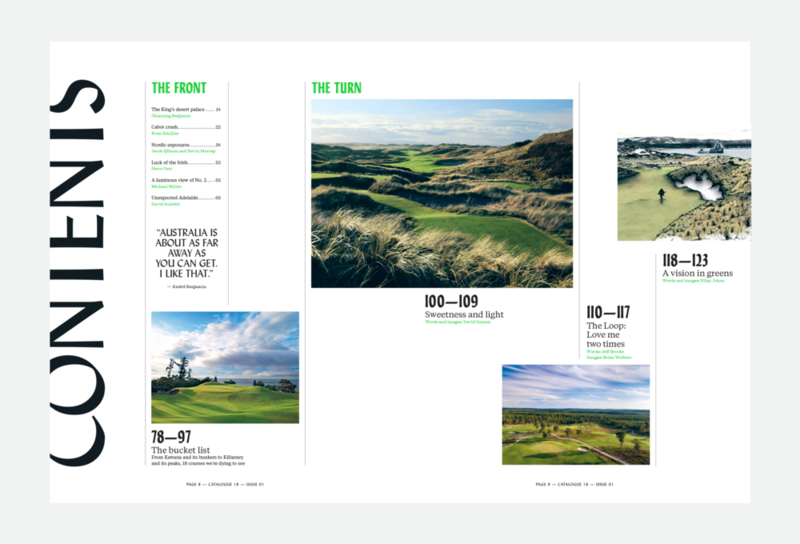 In 2017, Catalogue 18 approached us to help them create golf’s first subscription art magazine. The editor-in-chief, Guy Nicholson, believes that a golf course is its own art form, a combination of nature's palette and cunning human design. The right image of a seductive fairway or green might make you want to jump on a plane, cross an ocean and see it for yourself. Together, we spent more than a year and a half developing a lavish annual magazine filled with photographs, fine art and illustrations of golf’s most spectacular courses and landscapes. Two dozen highly accomplished photographers and artists are together in print, supported by essays, features and commentary from around the game. The result is a 300 page, perfect bound publication with coffee-table heft, and enough images to captivate a golf lover for months. The launch issue shipped in early 2019, and wouldn’t have been possible without many Kickstarter supports. The campaign raised nearly $47,000 to print and ship the first issue. You can snag a copy for yourself over here. Printed by the incredible team, led by Chris Young at Prolific Group in Winnipeg. Using Lydian by Warren Chappell, Lydia by Colophon and Typewriter by A2-TYPE. Photographs by Dave Baysden, Channing Benjamin, Josh Bills, Aidan Bradley, David Cannon, Steve Carr, Mike Cocking, Tony Harris, Linda Hartough, Gary Kellner, Russell Kirk, Patrick Koenig, Gary Lisbon, Kevin Markham, Kaia Means, Michael Miller, Kevin Murray, Brian Oar, Wood Sabold, David Scaletti, Evan Schiller, Jacob Sjöman, Stephen Szurlej and Lee Wybranski.